So far, 9 people have registered in honor of Layton. You can too. Layton was an extremely hard worker, a loving and caring person and a special gift to all of us. He lived his life to the very fullest and never had a dull moment. He was a tremendously skilled carpenter, a great fisherman and hunter and a master of Ping-Pong! He set a great example for all of us. He showed us during his lifetime that you should work hard, play hard and never give up. We celebrate all that Layton has taught us and the impact that he made on our lives. He was a truly amazing gift, one that does not cease as he touches a multitude of families through his gift of life to others. Although he will be greatly missed, we count our blessings of each moment we had with him and we will allow his legacy to live on through us by giving, caring, and living our lives to the fullest. Layton is an inspiration to us all. I encourage you to register under Layton’s name here, on this website, so that Erin, Sherri, Greg and the Gaskie’s can see the impact that Layton has made even after his lifetime. It is important that Layton’s family can see how many people Layton inspired to become organ donors (even if you were already an organ donor-please still register here by clicking the link under his photo). But, we ask that in addition to registering here, please hold fast to your decision to give by completing your donor registration within your state. Thank you all for deciding to give the gift that Layton gave. He would be proud. We also invite you to leave a favorite memory of Layton in the comments section below. Become a part of Layton Gaskie's story. Click Here. I met Layton in 1999. He was my first boyfriend. He made an impact on my life. I think about him often. Anyone and everyone is lucky to have known him. 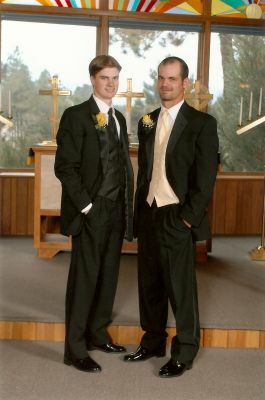 Adam and Layton on our wedding day...a day that probably wouldn't have been possible without Layton. God used Layton to orchestrate an event that led to the formation of our family. He has given life to more families in his death. He has inspired others to donate life to more families in the future. Truly a wonderful man of God credited for blessing many families! Layton was a very dear friend of ours spanning back to high school. Layton and Adam were on the wrestling team and captained the team together their Senior year. Layton was responsible for setting Adam and I up on our first date towards the end of our Senior year and he attended our wedding just a few short years later as our groomsman and honorary best man. We have so many incredible memories to cherish from our many hours spent devoted to wrestling, shenanigans at school, and the fun we enjoyed as a class and great friends outside of school. Layton was a hard-working, devoted, and passionate man. Erin was the best thing that ever happened to Layton. She made a wonderful man into an even better one. We miss our friend terribly and think of him so much more now that he's gone. We have so many things to share with him when we see him again. We are comforted to hear of the many precious lives he has saved through his organ donations. We are registered donors in Arizona and we are proud to donate in memory of our dearest friend. Layton was a very dear friend of ours spanning back to high school. Layton and I were on the wrestling team and captained the team together our Senior year. Layton was responsible for setting Abby and I up on our first date towards the end of our Senior year and he attended our wedding just a few short years later as our groomsman and honorary best man. We have so many incredible memories to cherish from our many hours spent devoted to wrestling, shenanigans at school, and the fun we enjoyed as a class and great friends outside of school. Layton was a hard-working, devoted, and passionate man. Erin was the best thing that ever happened to Layton. She made a wonderful man into an even better one. We miss our friend terribly and think of him so much more now that he's gone. We have so many things to share with him when we see him again. We are comforted to hear of the many precious lives he has saved through his organ donations. We are registered donors in Arizona and we are proud to donate in memory of our dearest friend. Traci Gibson just registered to become a donor in honor of Layton Gaskie. Layton was an amazing man who lived a life full of love, honor & integrity. I am proud to be able to say he was my brother & I know that he will bring a piece of heaven to all those blessed by his gift. I'm sure that all those blessed by his gift will find a new love for carpentry, the outdoors & quite possibly Coors Light. We were truly blessed to have him in our lives and we will miss him so very much. Layton was the greatest blessing in my life and I miss him everyday. I thank God for blessing me with him and for giving us 7 amazing years of marriage together. He inspires me to be a better person and to live everyday like its my last. Thank you to everyone who is honoring Layton's memory by becoming organ donors. Layton was such an amazing person. He lived life fully every day and gave his all to everything he did. I am proud to have been his mother-in-law. Layton, you are missed so much. I love you!